Today we had a visitor to our work that required us to dress up (it's just horrible to have to dress business casual every now and again! no jeans or tshirts!) Our visitor today was the local Representative to the US House, Sam Johnson, who represents the district where my work is located. 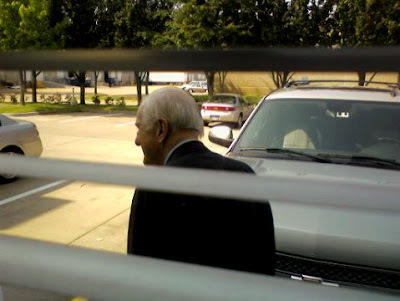 This was as close as I got to him, peaking out at him through some mini-blinds =) Apparently the congressman held a local town hall meeting in Richardson last night. Forgive the picture quality, this is a phone photo!! There you go, rubbing elbows with the big wigs again. So when does your political career start?